It’s a proven fact… look nice, feel nice, be nice. Running outfits are no different… look good, feel good, run good. HAT OR VISOR: Mandatory. This keeps the sun out of your eyes, mops up sweat from your forehead, can sometimes keep your head cool, keeps ponytails in their place, hides bed head. SUNGLASSES: Mandatory. Protects eyes from sun, wind, rain, wrinkles, bugs. Hides eyes from other people when you’re just not in the mood because the run has gone on forever and is never going to end. TECH SHIRT: Mandatory. Cotton weighs thousands of pounds once it gets saturated with sweat. Tech shirts have moisture-wicking properties that allow you to sweat and sweat and sweat and won’t weigh any more wet than it does when it’s dry. Must have the brightest, gaudiest color on race day in order to stand out from the other 25,000 bright, gaudy colors. SHORTS: Of course mandatory. Compression shorts are best for sucking all the fat in with less chance of chafing because they don’t ride up. For added slimming effect, wear black. Always. COMPRESSION SLEEVES: Mandatory. Get shin splints? Wear these. Extra support for the calves, promotes blood flow to the lower legs and feet. Great on long car and airplane rides too. Gaudy colors work here too. 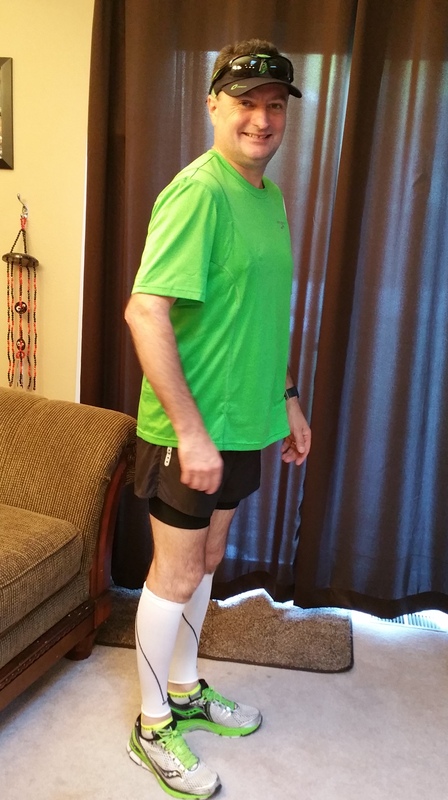 RUNNING SOCKS: Good running socks are above and beyond mandatory. If you don’t have the right socks to wick away moisture, your feet will blister at mile 5 and you’ll be left to limp across the finish line with nothing to look forward to other than a long, painful healing process and a toenail that has lifted off because the blistering was so severe. SHOES: Mandatory. Everyone knows shoes are the essence to all things happy, don’t they? Running shoes are no different. Don’t run a race in them if they have more than 300 miles logged. 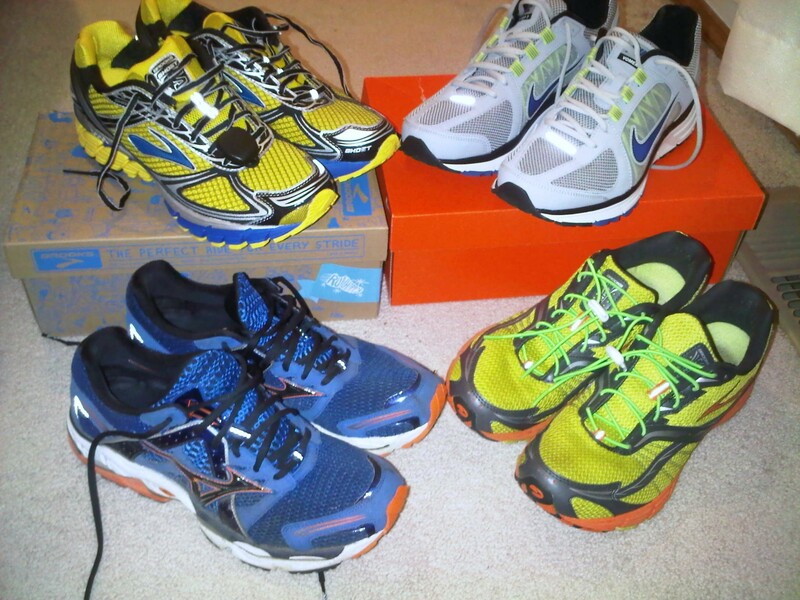 Instead buy multiple pairs of the same brand, type and version so as not throw off your pace, your form, your training. Going price: $150 each. GPS WATCH: Mandatory. Can’t run well if you don’t know your pace, your elevation, your mileage, your time. Make sure it has a pause button so you can sneak those walk breaks in and not have it mess up your overall time or pace. iPOD: Mandatory. Lose yourself in your music, tune out the world, run to the beat. It gives you something else to focus on besides all the pain you’re feeling. This entry was posted in Training and tagged beginning running, dressing for a race, running, training on July 21, 2015 by Paula. Great list, even better explanations! Not many people truly appreciate the humor of the Tammy Faye School of Beauty anymore, we’re showing our age! And thank you to Jamesy for demonstrating proper running attire!! Make up?!! Do runners use make up? I can’t imagine what they must look like at the end of the race. ROFL! BTW, that running outfit looks great!